The male delivered a small fish for the female just before 10am.this morning. All is well on the nest. 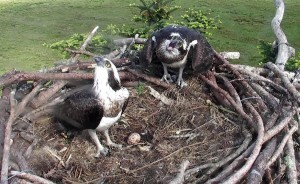 During the week one of our protection site volunteers noticed just how keen the male is to incubate the egg. The male had just arrived on the nest and tried nudging the female so he could incubate. She wouldn’t budge! He started to move twigs and branches around her and when that didn’t have any effect he wing flapped next to her. The intent of his actions were quite plain to see. She did eventually move but was in no hurry. Yesterday afternoon an intruding Osprey circled high above the nest. 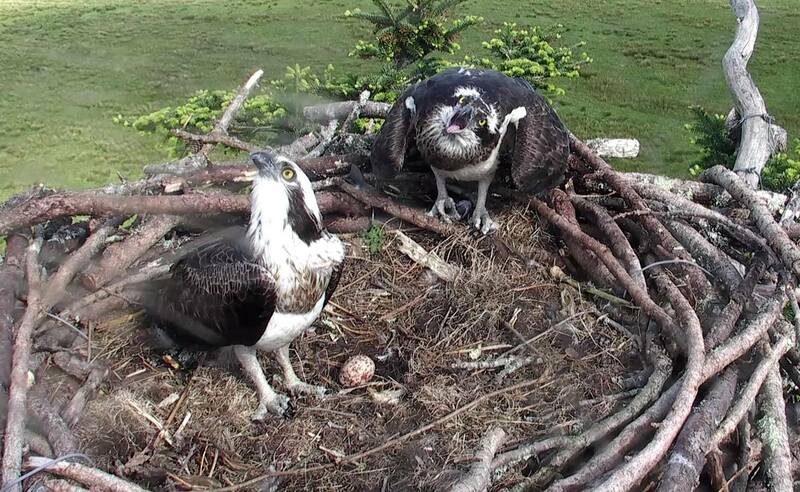 Both Glaslyn birds mantled and the female called loudly. The intruder eventually left and calm was restored.